Shrink wrapping is the process whereby items are wrapped tightly in plastic so they cannot move around easily, break, fall apart or break open. Bottled water, bags of nuts, chips or cereal and various other products are regularly shrink wrapped to preserve freshness as well. 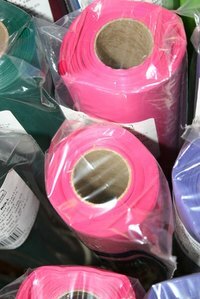 While this is usually something only done for commercial products to be shipped to businesses or sold in stores, there is a method by which you can shrink wrap and seal just about anything you want in the comfort of your own home. Remove the roll of plastic wrap from the box. Wind the plastic around the item you wish to wrap until you are satisfied that it is effectively covered. Then tear the plastic wrap from the roll and hold onto this end. Place the loose end against the plastic wrap which you have wrapped around the item. Light a long stove or grill lighter and run the flame over the end of the plastic wrap, melting it into the plastic which is wrapped around the object. Do this all along the edge so that the end of the plastic wrap is permanently fused with the plastic on the object. When wrapping larger items with rolls of plastic wrap, use multiple rolls from multiple different directions. The weight and tightness of the final wrap will hold down the rest of the plastic around the object once it is melted in place. Melt the plastic edge to the other pieces of plastic carefully, making sure you don't burn the object itself. If this is too difficult to do, heat up a piece of metal and touch it to the plastic edge, melting to the rest of the plastic wrap.